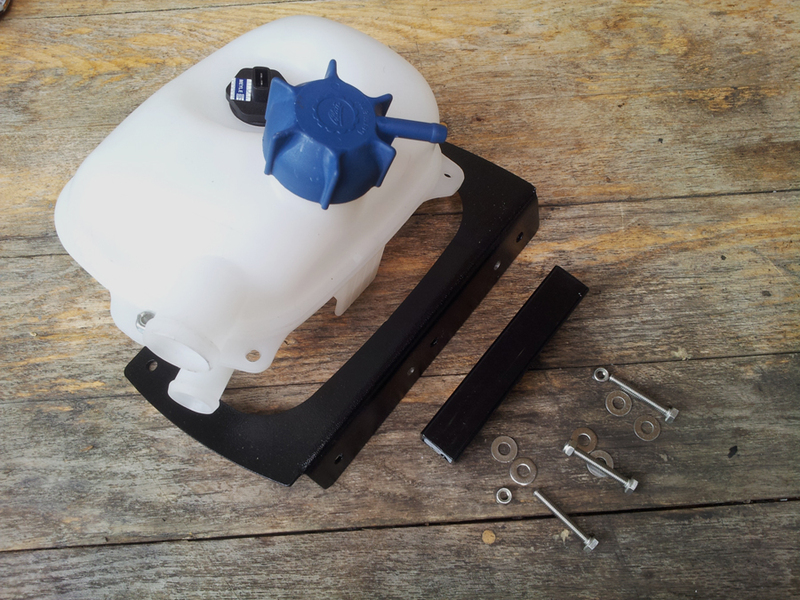 Remove the old rotted and crumbling insulation beneath your engine cover and replace with this slick modern upgrade. 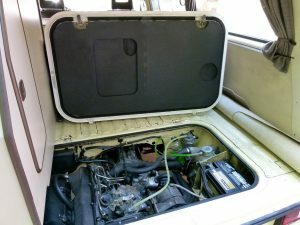 The Vanagon’s engine, as you undoubtedly know, is located in the rear of the vehicle, and is accessed via a large opening in the rear deck, covered by a lid. The underside of this lid is covered with a sound-deadening heat insulation. 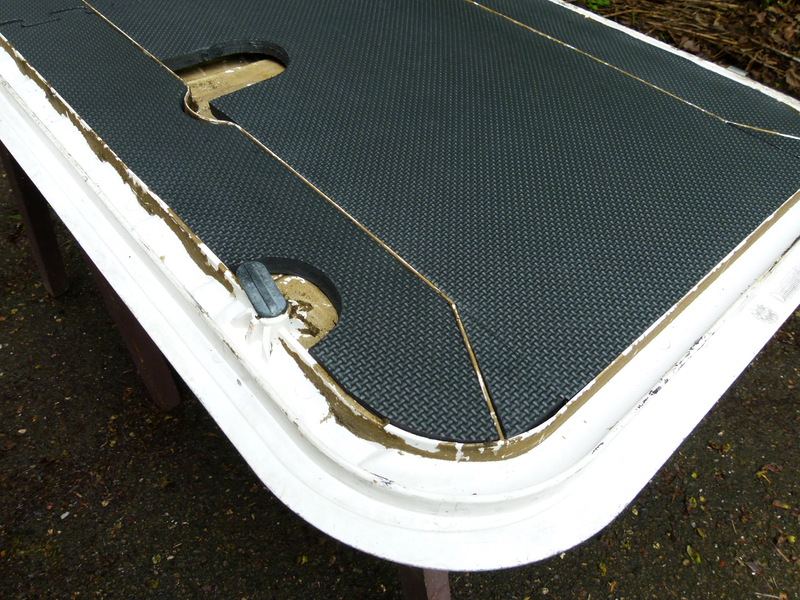 The older metal deck lids use a synthetic batting, while the later fiberglass lids utilize a foam rubber. Regardless the type, after 30-40 years the insulation has usually disintegrated, and absorbed dirt and oil, no longer providing sound-damping, and creating a potential fire hazard. I replaced mine with two 1/2″ layers of EVA (ethylene vinyl acetate) foam, intended as flooring in home fitness rooms. EVA is resistant to chemical, oil, and fuel spills, and provides thermal insulation and acoustical damping properties. Easy to cut and shape, this modern lightweight, closed-cell foam comes in 24 x 24″ (60 x 60 cm) interlocking tiles, is affordable, easy to apply, and should last for many years. 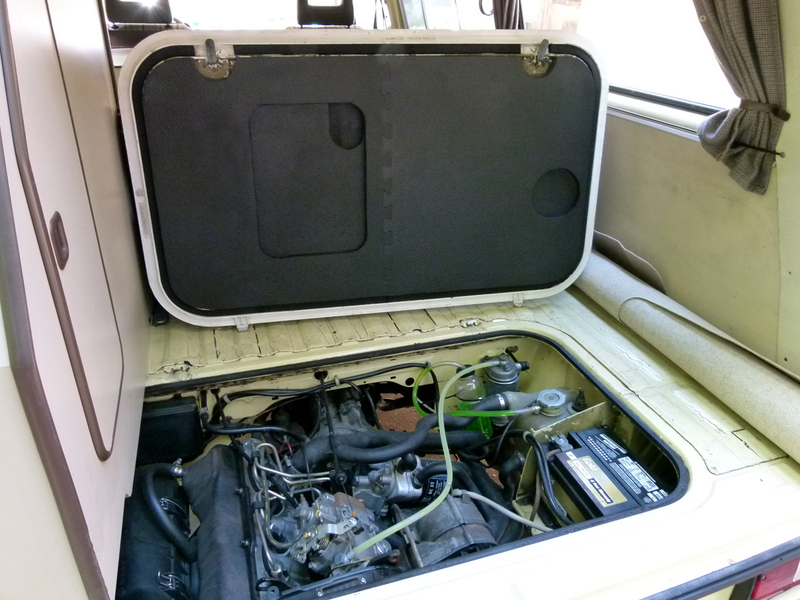 We’ll start by removing the original sagging insulation, cleaning the engine lid, then apply the new foam! 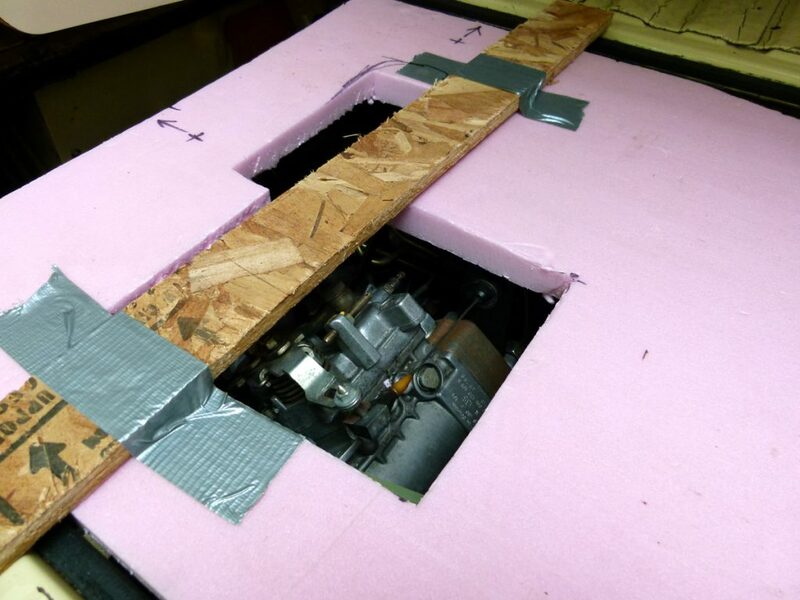 Lay the engine deck lid upside-down on a workbench or sawhorses. 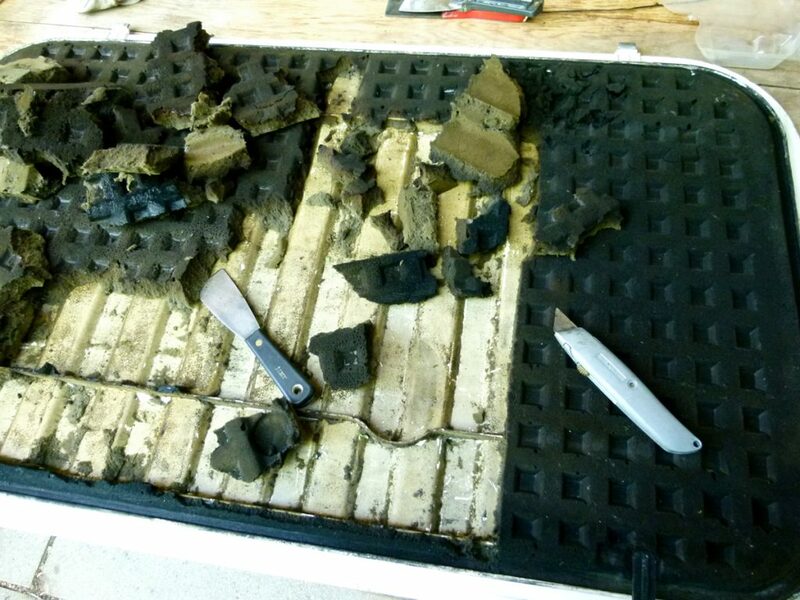 Take some photos or measurements of any depressions molded into the original foam; these provide clearance for various engine components and you’ll want to include these in your new insulation later. 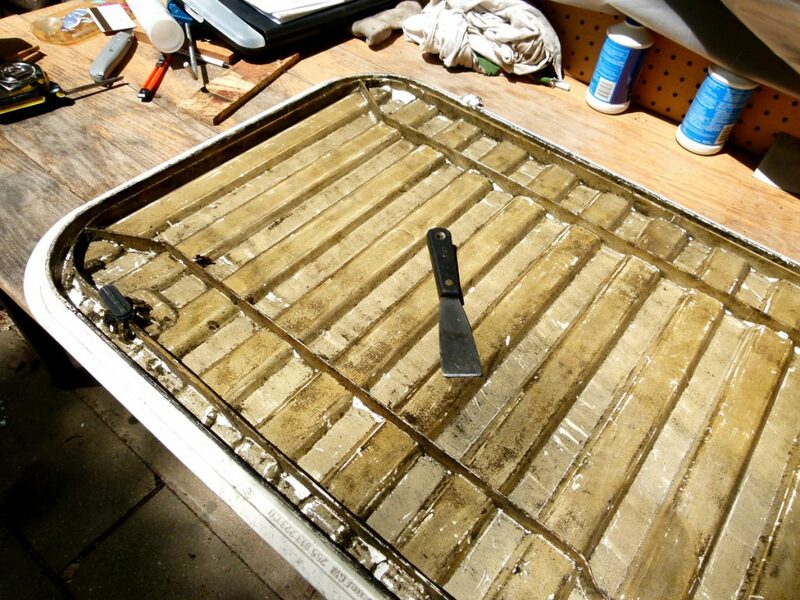 Begin working loose the old foam using a utility knife and a sharp 1.5″-wide putty knife or paint scraper. An even narrower scraper may be helpful in removing the foam from the corners and recesses of the lid. 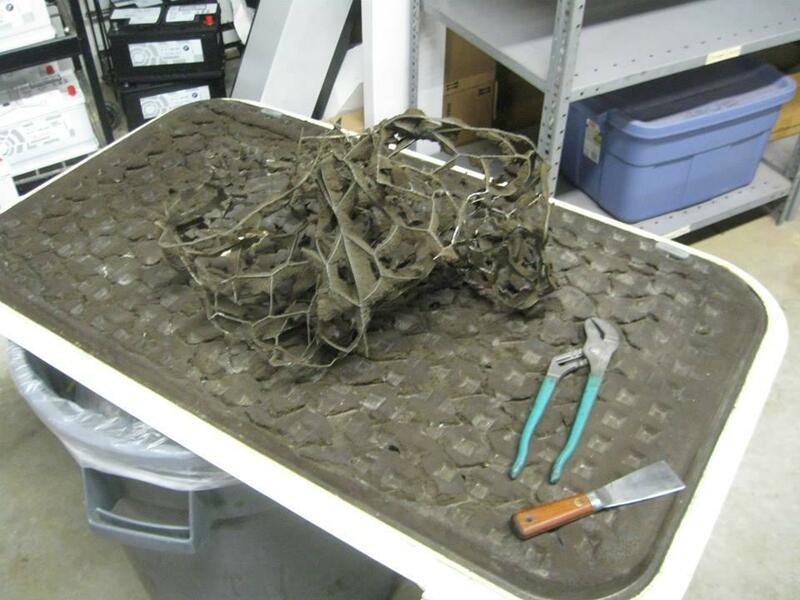 On certain model years of the Vanagon, this foam insulation is embedded with a chicken-wire-like mesh; remove this as well. 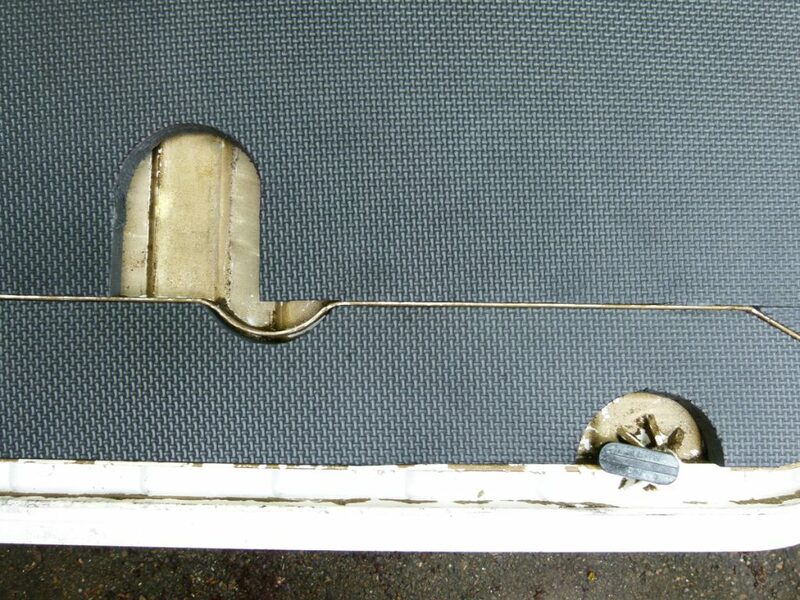 Remove as much of the old foam bits as possible, to ensure a good clean bonding surface. A home pressure washer is effective for stripping and cleaning the engine cover. 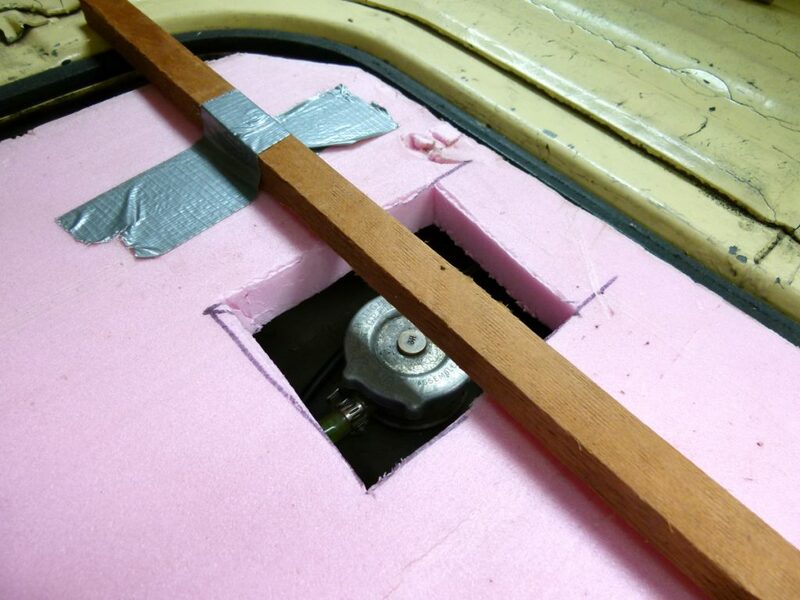 Pay particular attention to the raised areas of the corrugations, as this is where the new foam will be glued. If necessary, scrub the surface with an abrasive scouring pad dipped in acetone or other solvent to remove as much of the old adhesive as possible. 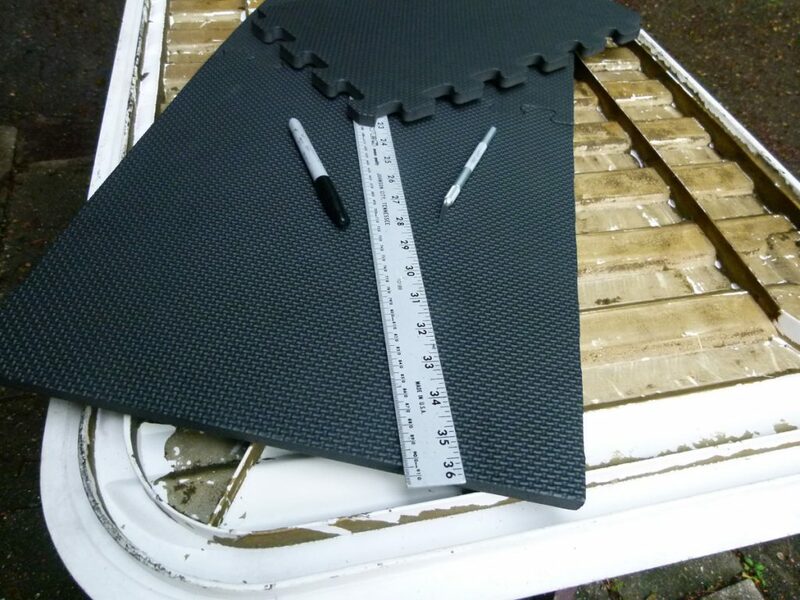 NOTE: Two layers of 1/2″ foam will be 1″ thick, of course, and this may be somewhat thicker than your original foam. 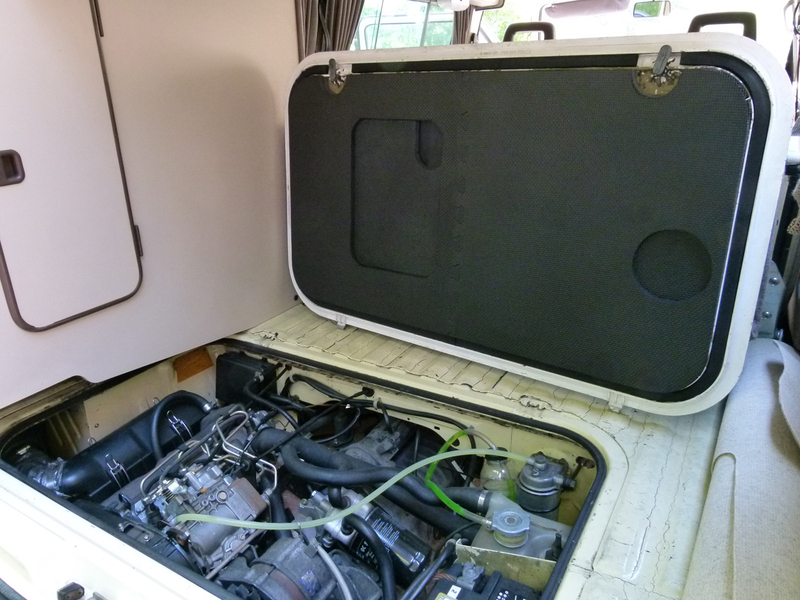 In addition, I had recently installed a different engine which was a little taller than the original power plant, necessitating different clearance areas in the new deck lid insulation. 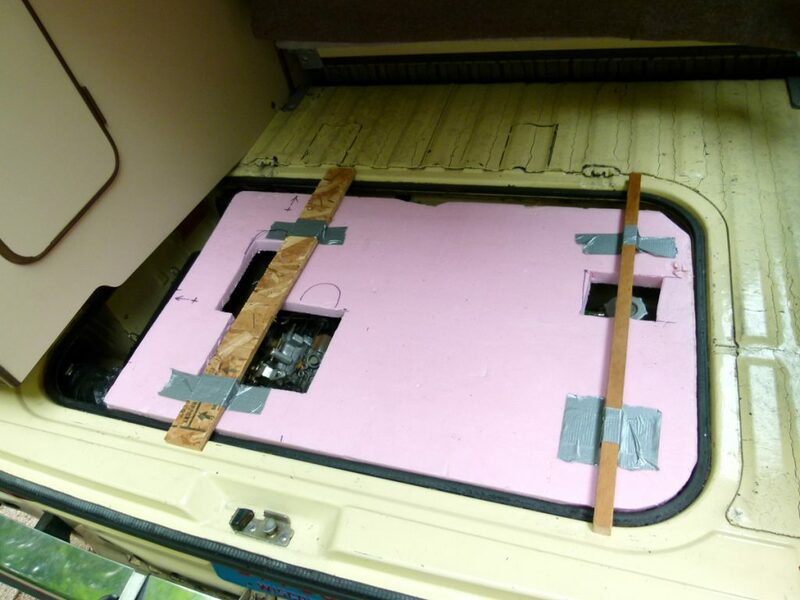 Just to keep it all straight, I rigged up some scraps of rigid polystyrene foam insulation at exactly the same final depth of the new deck lid insulation, so that I could visualize where I needed to cut relief areas (cardboard will work too). I then used these scraps as a pattern to make matching relief cutouts on the new foam. Remember to label the Top and Bottom sides of your template to avoid errors! Starting in one corner, measure for your first section of the new foam. There are two lateral reinforcing ribs running across the decklid, which you’ll need to work around. The EVA foam tiles feature interlocking ‘jigsaw’ edges, so snap a couple of tiles together into one piece before cutting. Focus your attention only on the first layer for the moment; you can use this as a pattern for the second layer. The foam is easily cut with a utility knife and a metal straightedge. Cut a piece to fit the main center area first, then the narrower sections at top and bottom. 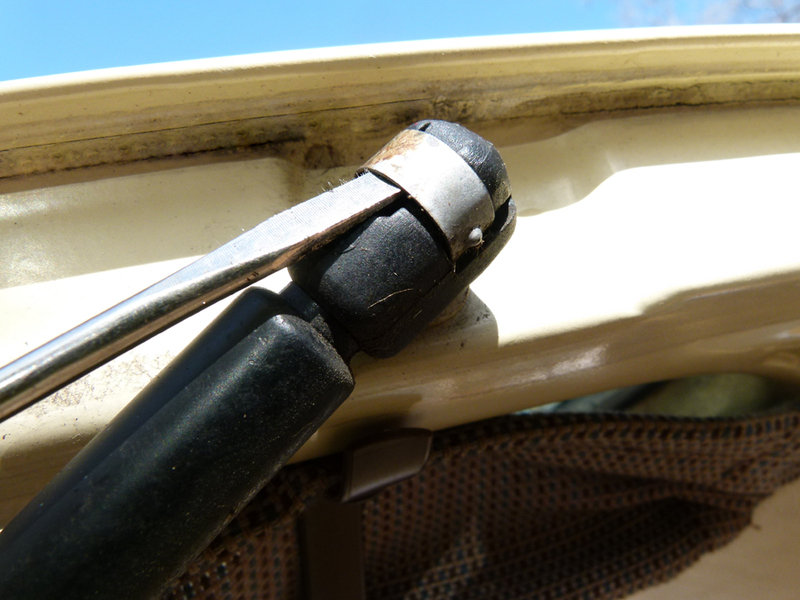 Remember to provide clearance areas for the latch mechanisms. From your scraps, cut smaller pieces to fit any remaining bits. Repeat to make the second layer, staggering the jigsaw seam with the first layer, and adding any relief areas. My first attempt to glue the foam tiles into position using a spray adhesive did not work well, and soon came loose. I’ve had good long term results using a good contact adhesive instead. 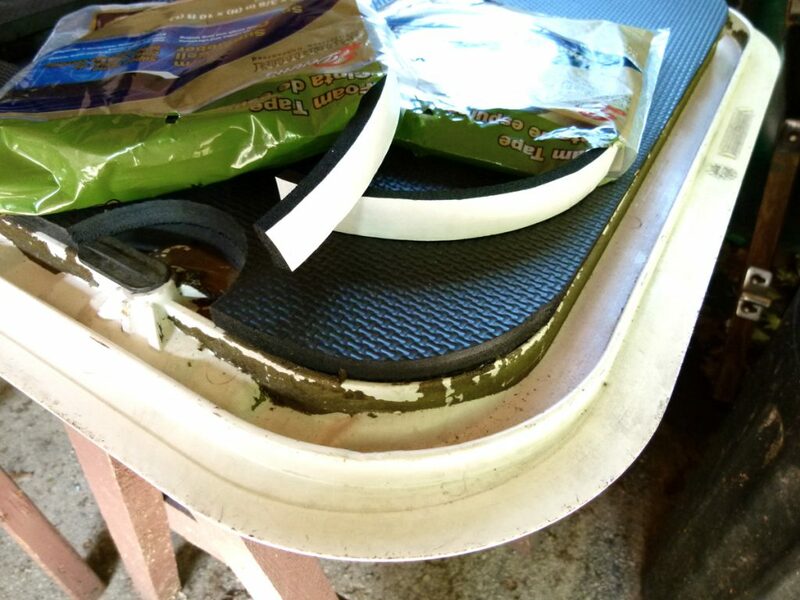 Following the maker’s directions, use a brush or small roller to apply contact adhesive first to the raised corrugations on the deck lid, then across the entire porous underside of the first foam layer. 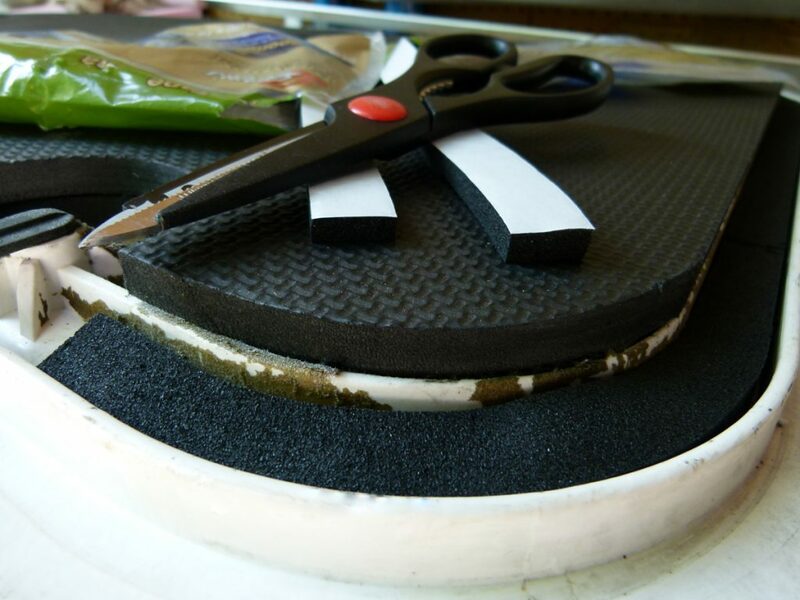 Allow both to dry about 15 minutes, then carefully fit the foam and press into place. NOTE: this dry-fit method provides a much stronger bond, but allows NO time for repositioning your work pieces, so you must get it right on your first try. Repeat for the smaller areas, then for the entire second layer. 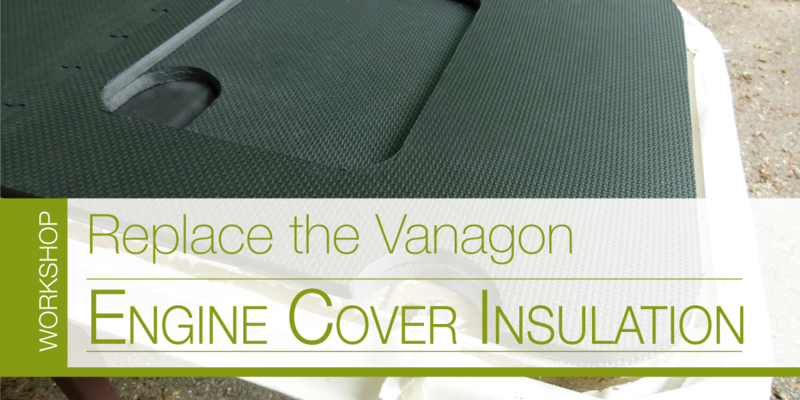 Consider using silicone sealant or other caulk to seal the ‘jigsaw’ seams. 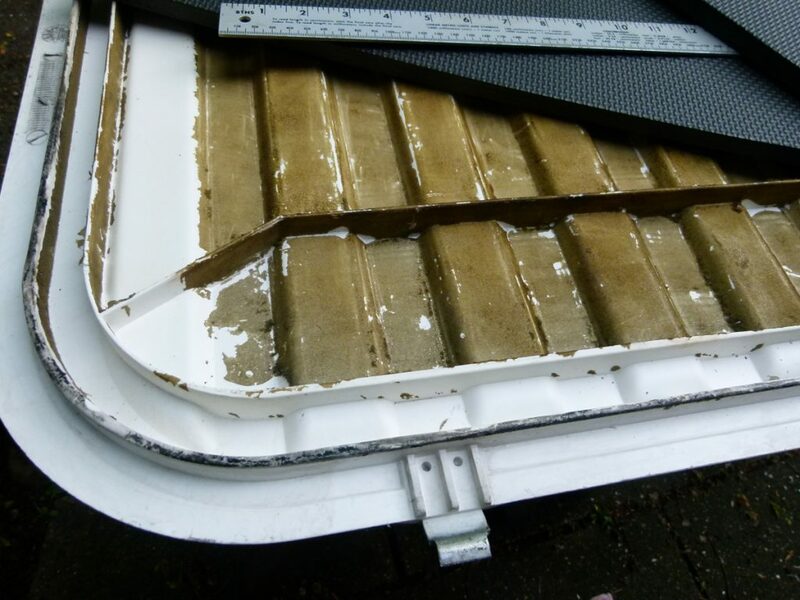 The outer groove running around the perimeter of the deck lid should be likewise sealed using 3/4″-wide closed-cell foam weatherstripping. 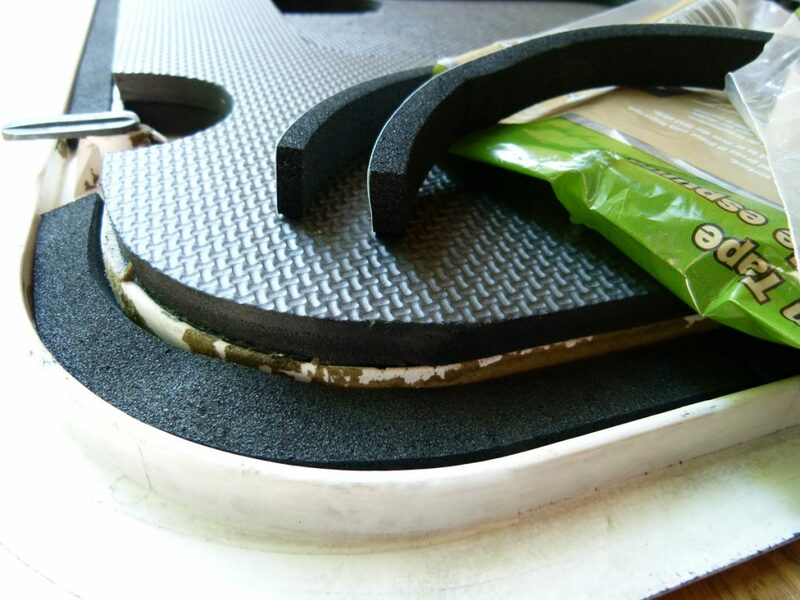 For additional sound-damping, you may consider adding a final layer of FatMat, a self-adhesive acoustical insulation, over the EVA foam. Test-fit your deck lid to check for any clearance issues, then apply some Armor-All or other protectant to help keep it clean. This new foam is fuel-, oil-, and heat-resistant, and will provide effective sound and heat insulation for many years to come. What do you think? 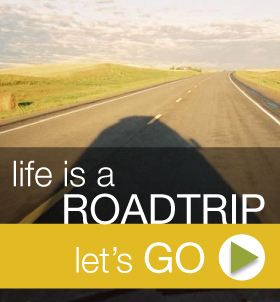 Leave a question or comment below! Great idea for an age old issue. Well written and pictorial documentation. I tried a bed liner undercoating types of material; worked for a while but any surface abrasion causes the old foam to crumble anyhow. 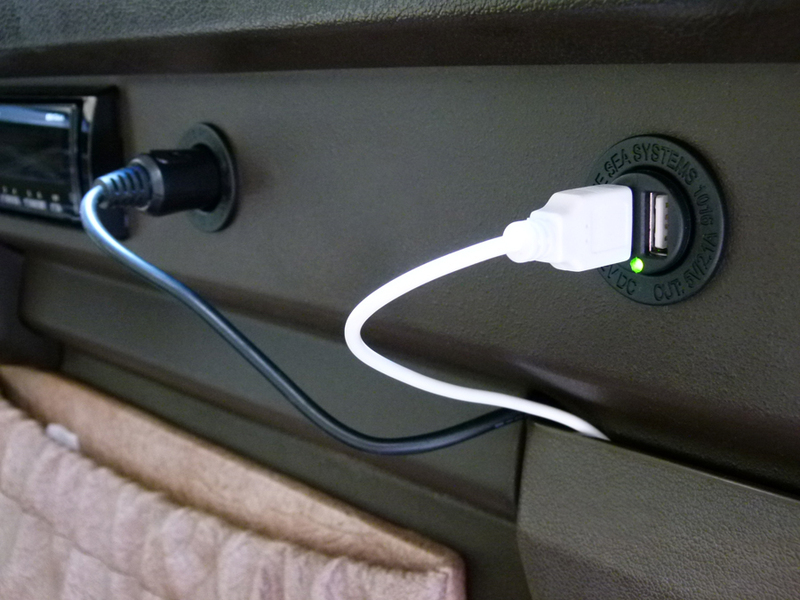 Well great another project now for the Westy ! Robert, that old stuff can be a real mess. Hope this idea works better for you!